Key Biscayne Fire Rescue would like to thank all of you in the community for being an integral part of keeping our Island Paradise safe for our children and teens. 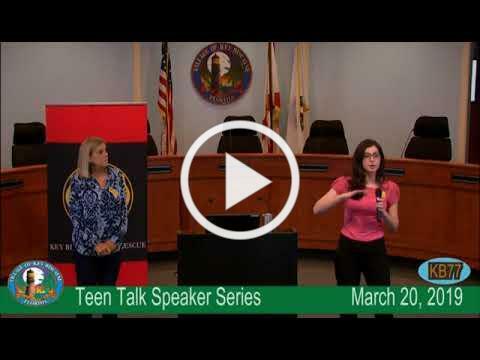 Below you will find the video recording of "Teen Talks Series 1: Risky Behavior in Teens & Pre-Teens". This was the first of a series of discussions for families and caretakers of young people. Please feel free to share this video. We look forward to hosting more discussions on these matters. An encore presentation of "Teen Talks Series 1: Risky Behavior in Teens & Pre-Teens" will take place at 6:00 p.m. on Monday, April 22, 2019. All interested parties who could not attend the daytime presentation are invited. Follow this link for details.